Every doll needs a nightie and although my Summer Nightie pattern is super cute, it’s just not warm enough for those cold winter nights. 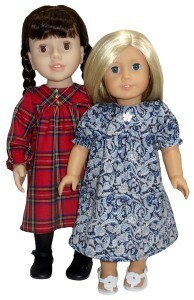 So I’m thrilled to now have a beautiful Winter Nightie doll clothes pattern available for the 18 inch and American Girl dolls. This Winter Nightie pattern is more than ‘just a nightie’! The options with this pattern make it super versatile – Make it short or add a ruffle around the hem to add extra warmth and cuteness, make it with long sleeves just like in the photo to the right or use the short sleeve option to create a nightie suitable for summer. You can use warm flannelette, silky satin or cool cotton fabric to make some gorgeous nighties. Or if you’re clever with your fabric choices, you can use this very same pattern to make either a stylish winter or cool summer dress. Otherwise known as the ‘Dress It Up Nightie’. Can’t decide which one to make? 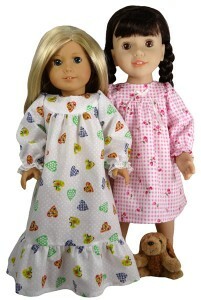 Then make them all and your doll will love her collection of new nighties and dresses. And the great news is that when you purchase any of my patterns you now get LIFETIME access to the pdf pattern pieces, written instructions and ALL my step-by-step video instructions for the pattern. For everyone looking for the 18 ½ inch Cabbage Patch size pattern, it will be coming soon so keep your eye on my Facebook page for updates or your email inbox if you are a subscriber and you will be first to know. Click here to get your pattern now and have the nightie made in time for your doll to wear it to bed tonight. These look soooo cozy that I want to make a matching one for myself! Thank you! Thank you for your patterns. They’re adorable!